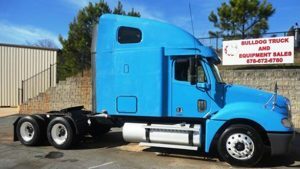 Bulldog Truck Sales in Atlanta, Georgia is a truck leasing company you can count on to provide late model, quality brand name trucks at affordable prices. Our leasing program is designed to help those independent owner operators who have experienced credit issues in the past, but are now stable and ready to get back to work. Unlike some of our competitors, we structure our short-term leases to be successful. Our goal is for our customers to own trucks they can be proud of at the end of a two to three year lease. If you have had credit problems in the past, but are now stable and have a contract with a reputable carrier, we can help. Call or visit our facility today so we can get you on the road to a better future! Bulldog Truck Sales offers big rig trucks for lease at affordable prices with attractive, short-term leases. We are the home of flexible financing and our friendly and knowledgeable staff is here to help you get into a lease that will help you succeed as an independent contractor. We offer a wide variety of quality, late model, brand name trucks that are DOT ready and come with a one-year warranty included in the price. If you are interested in a lease, we invite you to come to our facility North of Atlanta, Georgia to test drive our trucks. Even if you have bad credit, you may still quality for one of our affordable truck leasing programs & financing options. If you would like to be considered for credit with Bulldog Truck Sales, please complete the secure online application in full. A member of our team will then contact you to discuss your leasing options. Contact our Truck Leasing Professionals today or call our office to speak with one of our knowledgeable and professional staff members.We look forward to serving you!